1. Peel the skin of ash gourd and remove the seeds. Grate it and pressure cook. 2. Heat ghee and roast raisins and cashews. Keep aside. 3. Transfer the cooked ash gourd into a thick bottom pan and cook until all the excess water evaporates and becomes dry. 4. Now add sugar and mix well. Keep on stirring until it becomes single mass or halwa consistency. 5. Finally add roasted raisins, cashews and cardamom powder. Remove from heat and serve. Note: When you grate the ash gourd, it releases more water. If you want, you can use that water while making the halwa or else you can use that for making any curry. 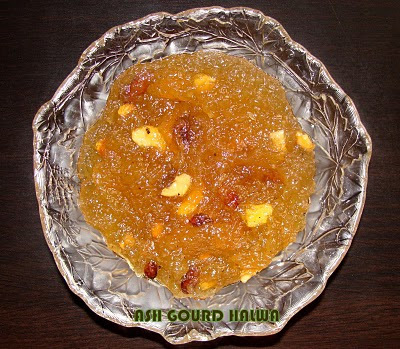 This recipe is also called Kashi Halwa.